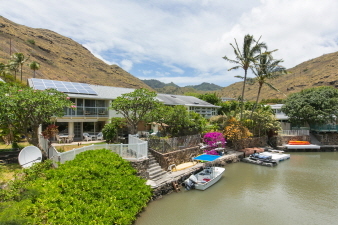 Hawaii Kai canal front 3 bedroom, 1.5 bath townhouse with two car garage, large fenced yard, and water access. End unit with privacy. Upgraded kitchen and baths. Covered utility/laundry area and storage. Outdoor covered lanai area and garden to enjoy. Put your kayak in the canal directly behind the home and paddle out to the ocean! No maintenance fee! Just low $400.00 yearly marina fee. These townhouse rarely come on the market. Home has 18 photovoltaic panels for low electric bill. Priced to sell quickly!